👉 What will I learn? Upgrade (include timed upgrades) and Save features. 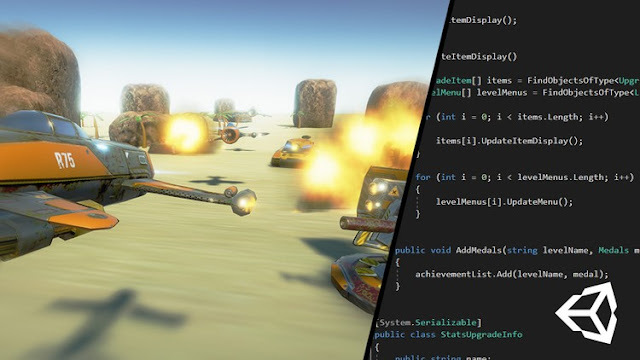 In this course we will create a full Shoot Em Up game (Skyforce, Raiden) from scratch in Unity. You will learn about object oriented programming and have an overall better understanding of C#. We will provide you with all the assets needed to create the game (including 3d models, audio), feel free to use these assets in your own games. In this course we will discuss the concepts and advantages using Component Based Design, and also features such as Movement, Shooting Pattern, Curved Movement with Nodes, Scene Transitions, Saving and Loading, Coins & Human Rescue, also Medal Achievement, just like the one in Skyforce Games. Basic knowledge in C# is a plus, but don't get discouraged, since in most of the lessons, we will start the script from a new one, so anyone can follow it.